Using customized scripts directly on the database layer or developing complex test scenarios in client applications continues to be required in parts, even with the use of SAP HANA capture and replay. However, the possibility to capture a test scenario executed on the database layer and then replay it on different systems multiple times can facilitate testing immensely. 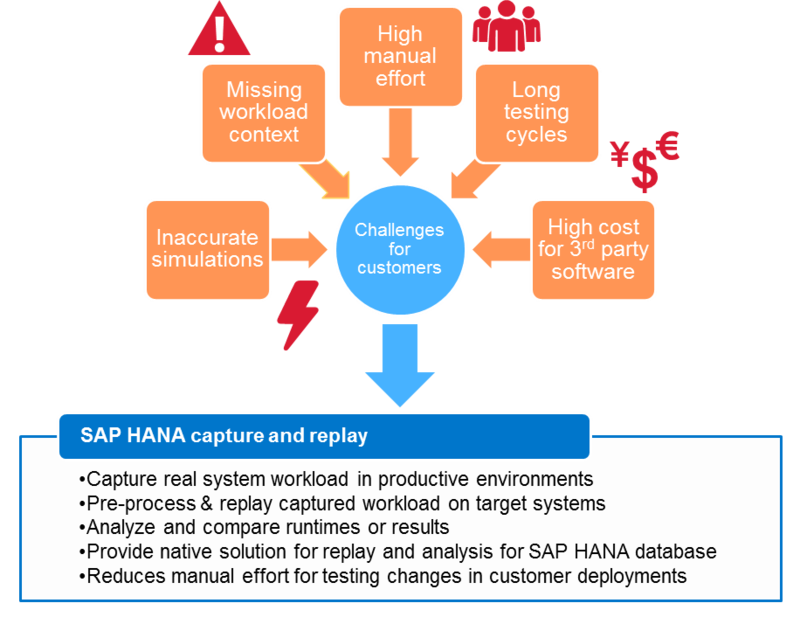 Why use SAP HANA capture and replay? With SAP HANA capture and replay, users can either use existing test scripts or scenarios and capture their execution, or capture workloads during regular system usage. Either way, these captured workloads can then be used for extensive replay on systems with different characteristics, such as changes in data distribution, data models, partitioning, as well as different revisions, changed .ini-files and more. Using SAP HANA capture and replay, users can indicate and estimate whether a certain scenario or system configuration improves or degrades the overall workload runtime, introduces regressions in the form of mismatched results and more. These indicators can offer support in deciding on a way forward regarding a certain change made or a planned upgrade, for example. Of course, there are many other scenarios for which SAP HANA capture and replay can be used as well. Overall, the process of using SAP HANA capture and replay mentioned in my blog for its initial release with SAP HANA 1.0 SPS12 is still relevant. Generate workload on the database using the existing scripts, applications, clients and capture it using SAP HANA capture and replay. Use SAP HANA capture and replay to pre-process the workload and prepare it for replay on the desired SAP HANA system. Use the replay report to analyze runtime- and result-based differences between the initial capture and the replay (or between different replays, if available). 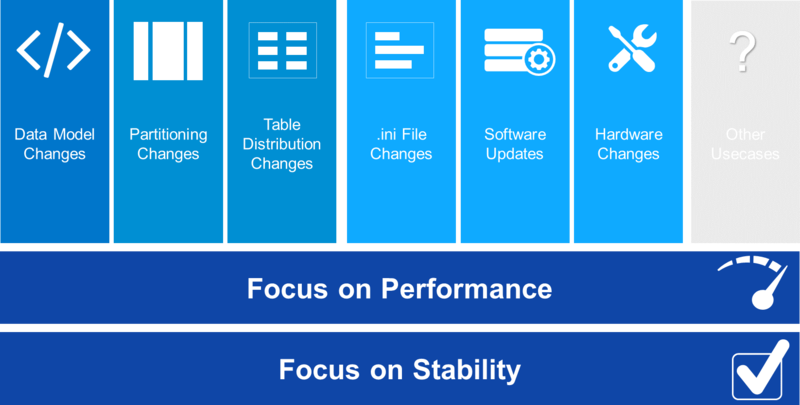 Since the initial release of SAP HANA capture and replay with SAP HANA 1.0 SPS12 as part of the SAP HANA Performance Management Tools, many enhancements have been added in SAP HANA 2.0. They broaden the supported capture scenarios, improve the usability of the replay results, and offer new options when configuring captures and replays. Improved capture support: capture of XS classic requests and queries including NativeFAE/FDA requests. Support for time window- or disk space-based capturing: new options for defining continuous captures based on duration or disk space percentage. Support for multiple replayers: multiple replayer processes during replay for better scalability and performance. Support for transactional consistent replay and result-based comparison: enable check for transactional consistency during replay, as well as replay reports based on query results, not only runtimes. Support for replay to replay comparison: possibility to not only compare replay with base capture but also with other replays based on the same capture. In addition to these mostly server-side enhancements, SAP HANA capture and replay’s UI integration in SAP HANA Cockpit 2.0 has been further improved. Thanks to enhancements to the replay reports and capture and replay configuration, SAP HANA capture and replay is now even easier to use for customers. 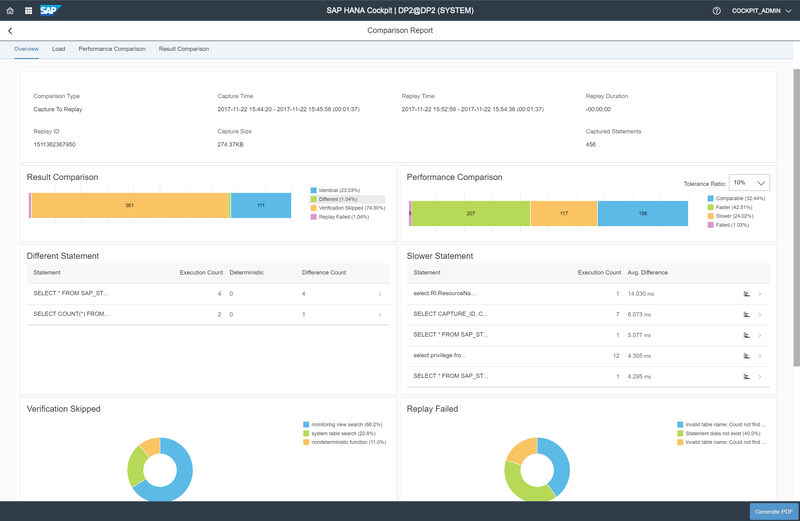 To leverage all these new enhancements, we recommend the usage of the latest SAP HANA Cockpit 2.0 build and patch set. Talking to our customers – we see that SAP HANA 1.0 SPS12 is still largely in use by them for productive scenarios. Therefore, we decided to make most of the enhancements related to SAP HANA capture and replay available within this version. Customers still running on SAP HANA 1.0 SPS 12 who want to benefit from these server-side and UI-side enhancements only need to deploy SAP HANA Cockpit 2.0 and are then good to go. Evaluation of runtimes across changes in SAP HANA revisions/SPS, hardware, data models, table partitioning, etc. Evaluation of result regressions across changes in SAP HANA revisions/SPS, hardware, data models, table partitioning, etc. Considering this number of enhancements, we will provide a new guide for SAP HANA capture and replay, complementary to the information provided in our official documentation. The guide offers information on setting up a system for the use of SAP HANA capture and replay, including details on capture and replay configuration, setting up a replayer and other prerequisites. It also includes detailed descriptions of available options as well as our recommendations when to use them, benchmarks and other KPIs, and system parameters and how to configure them best. Another portion of the guide deals with the reading of the replay report and offers insights into how to best navigate and read the presented results as a user. You can find the guide linked here. 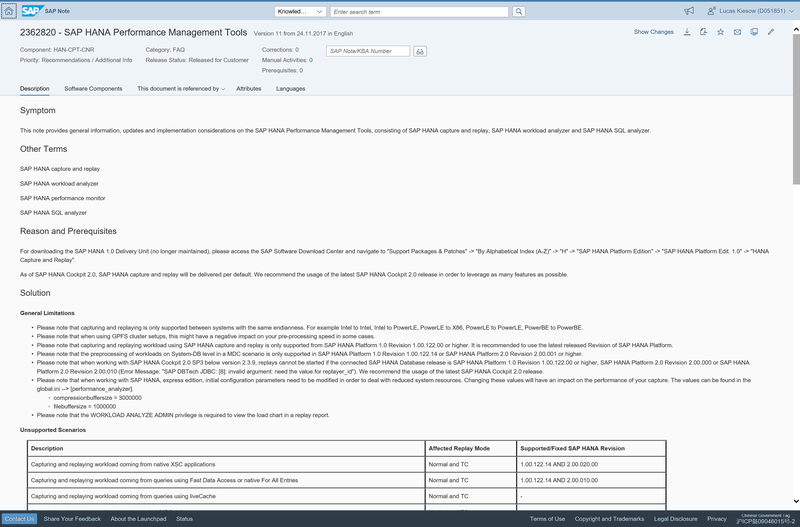 For any additional information, please also refer to our central SAP Note for the SAP HANA Performance Management Tools. Any feedback is welcome and we will continue to update this guide and our SAP Note as new features become available in SAP HANA capture and replay during the coming releases. If you have any other questions regarding SAP HANA capture and replay or the SAP HANA Performance Management Tools, please feel free to reach out to me directly.